With cyber security and threats often in the news, UNM Computer Science Ph.D. student Ben Mixon-Baca has become a go-to expert for local media as they cover stories about these high-tech issues. In the last year, Albuquerque’s KRQE TV station and the Albuquerque Journal have interviewed him about cyber security, hacking, and cyber theft. He is also featured in a Sandia National Laboratories (SNL) video about its Cyber Tracer Program, which develops methods to prevent, counter and minimize cyber-attacks, and protect valuable digital assets in the interest of national security. 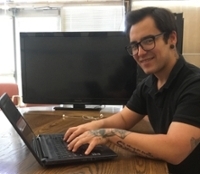 In addition, Ben was a teaching assistant for the Intro to Computer Networks and Intro to Cyber Security classes at UNM and taught memory forensics in a training workshop in collaboration with Kevin Nauer of SNL at Lawrence Livermore National Laboratory. He is the author of Towards Automatic Network Side-Channel Discovery Through Abstraction & Active Network Measurement. Ben hopes to finish his Ph.D. in Computer Science in 2020. His advisor is CS Professor Jedidiah R. Crandall. “My research topic is measuring the Internet using advanced measurement techniques developed in-house. Conventional measurement techniques do not give a complete picture of the Internet's characteristics and structure. The techniques and framework I am developing address short comings in current state-of-the-art. The end goal is to use this infrastructure to map out structures like firewalls, as well as uncover evidence of government and state-level Internet tampering 24/7,” he explained. A New Mexico native, Ben is the son of a single mother who lives in Albuquerque. “My mom’s creativity, work ethic, and determination inspired me and has made me the man I am today,” he said. His mother, Kay Frances, is the owner of Romero Jewelers in Albuquerque, where she designs custom jewelry. When he’s not working on his research or in class, Ben likes to play video games, guitar, tennis, and racquetball, draw, hike, and practice his hacking skills. He also enjoys reading about politics and current events because it helps guide his research.